The International Committee for the Red Cross is committed to assisting humanitarian projects between the two Koreas amid their conciliatory efforts, even as it copes with the consequences of some of the world’s most calamitous man-made crises, said the chief of the Switzerland-based organization in Seoul last week. 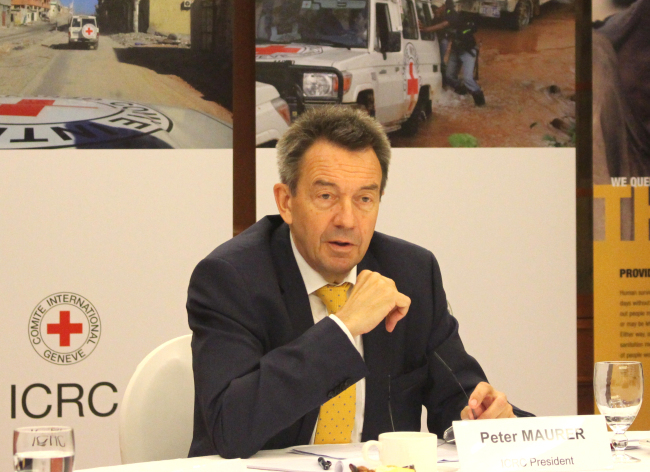 Peter Maurer, the president of the ICRC, came to Korea from June 4-5 to strengthen cooperation with Seoul by drawing the country’s continuing contributions and raising its public awareness. The former Swiss diplomat -- secretary of state for foreign affairs -- met with South Korean Prime Minister Lee Nak-yeon, Foreign Minister Kang Kyung-wha, Unification Minister Cho Myong-gyun and Korean Red Cross President Park Kyung-seo, among others. With regards to inter-Korean humanitarian cooperation, Maurer said the ICRC could lend help in public health, water provision and sanitation, as well as family reunions, identification of missing people and physical rehabilitation of the disabled. “The issue of separated families has been our main concern since the Korean War and we have, over the decades, always tried to carve out a neutral and impartial political space in which solutions for separated families and identifying missing people can be found,” he told a group of journalists on June 4. The institution has operations in over 80 countries around the globe, including North Korea. Since 2002, the ICRC has offered physical rehabilitation and related orthopedic medical services in partnership with the Democratic People’s Republic of Korea Red Cross Society and relevant state departments. It operates in hospitals in Hamhung, Pyongsong, Sariwon and Kaesong with a base in Pyongyang. The ICRC has also supported affairs related to the separated families between the two Koreas, offering technical expertise on handling data and logistical support. “We have also worked on educating North Korean specialists to decontaminate regions that are exposed to weapons contamination. We have done capacity building projects with the North Korean Red Cross Society, and trained the North Korean Army on international humanitarian law,” he said. Around the world there are 65.6 million forcibly displaced people, 22.5 million refugees and 10 million stateless people, the United Nations High Commissioner for Refugees tallies. Nearly 20 people are forcibly displaced every minute as a result of conflict or persecution. In Africa, the ICRC is critically invested in the Democratic Republic of Congo, Somalia, South Sudan, Central African Republic and areas surrounding the Lake Chad Basin, he added. During the visit to Korea, Maurer asked for continuing support from the Korean government, while expressing appreciation for the hitherto contributions and hoping the country will join the ICRC’s Donor Support Group. The Korean government and ICRC -- the world’s oldest humanitarian organization established in 1863 in Geneva, and producing four Nobel Peace Prize winners -- signed a Headquarters Agreement in Geneva on Feb. 26 to give the institution legal recognition in Korea. The ICRC’s Seoul office, which opened in March 2015, has promoted dialogue involving Korean diplomats, politicians, scholars, researchers, police, military officers and soldiers for political, financial and manpower assistance. It also raises public awareness of its activities and conflicts worldwide, alongside educating professionals on humanitarian law.